Tweezerman and Isaac Mizrahi will be celebrating the launch of their limited edition beauty and design collaboration at Sephora Times Square (1500 Broadway) on September 27th. Attendees will have the opportunity to Meet Isaac Mizrahi from 5-6pm with the purchase of any of the designer’s beauty tools (prices start as low as $5) – the newly designed tools feature fun neon-bright Splatter Paint and colorful Candy Buttons prints. Guests can also receive complimentary brow services from Tweezerman Brow Experts from 2-6pm at the Beauty Studio. 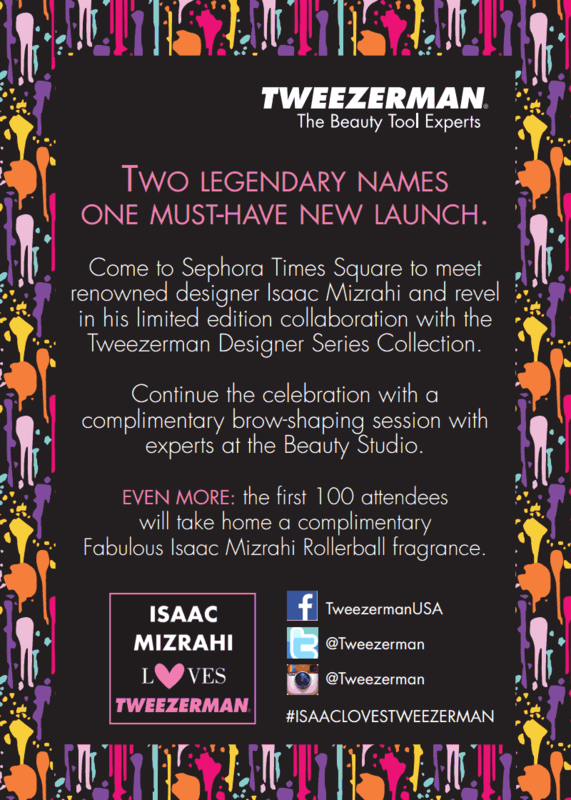 Additionally, the first 100 attendees will take home a free Fabulous Isaac Mizrahi Rollerball fragrance. Tweezerman and Isaac Mizrahi 2013 Limited Edition Designer Series Collection includes the award-winning Slant Tweezer ($25), Mini Slant Tweezer ($15) and Filemate Nail File ($5) available exclusively at Sephora and Sephora.com.